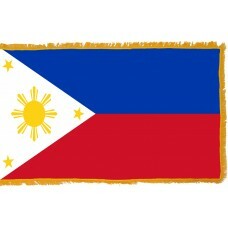 The Philippines Flag features two horizontal bands in the colors of blue and red. 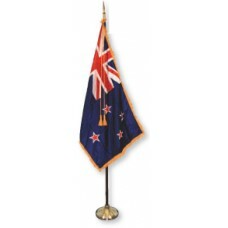 In the left corner of the flag is a white triangle pointing out towards the center of the flag. The triangle features an 8-rayed sun in the middle of it and in each corner of the triangle, there is a 5-pointed yellow star. The red color of the flag represents the courage of the people in the battle for independence and the blue color represents the willingness of the people to sacrifice themselves for the country and their freedom, peace, and justice. The triangle represents, "Liberty, equality, and fraternity." 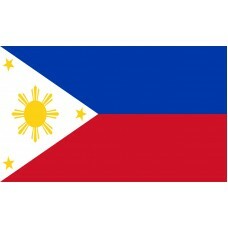 The sun on the Philippines Flag represents, "the gigantic steps made by the sons of the country along the path of progress and civilization." 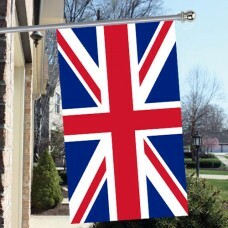 It represents the people's freedom as well as democracy. The eight rays of the sun represent the eight provinces that were involved in the Philippine revolution against Spain, which are, Manila, Cavite, Bulacan, Pampanga, Nueva Ecija, Tarlac, Laguna, and Batangas. The three stars represent the three main island groups of the country, which are, Luzon, Visayas, and Mindanao. The Philippines Flag was designed by Emilio Aguinaldo in 1897 and adopted on June 12th, 1898. The Philippines is one of the very few countries that uses the same national flag as a war flag. If the Philippines flag is displayed with the red color at the top, this indicates war. The Philippines is an archipelago country located in Southeast Asia that shares borders with the South China Sea, Philippine Sea, and Celebes Sea. The Philippines is made up of approximately 7,640 islands that are divided between the three main island groups (Luzon, Visayas and Mindanao) and is the second largest archipelago country in the world. The capital city of the Philippines is Manila. The Philippines are home to many historical sights and many beautiful beaches, which attract approximately 1.5 million tourists a year. The earliest inhabitants of the Philippines were the Negritos. In 1521, the first European, Portuguese explorer, Ferdinand Magellan arrived on the island and claimed the islands for Spain. In 1565, Miguel Lopez De Legazpi arrived from Mexico, Hispanic settlements were formed and the Philippines became a Spanish colony. In 1898, the Spanish-American war began in Cuba, and eventually reached the Philippines. On June 12th, 1898, Aguinaldo declared independence from Spain, even though the Spanish had sold the Philippines to the Americans and they had control over the Philippines. This caused a lot of anger and conflict, which resulted in the Philippine-American War that caused 1,000,000 Philippines and over 5,000 Americans to either lose their lives or be wounded. The war officially ended in 1901, even though there were still battles until 1914, when the Philippines were promised independence, which they gained in 1946. The Philippines was the first Southeastern Asian country to gain independence following WWII. In Thy Breast is alive.